Three years after two rides culminated first in a courtroom and then in an ER (with no permanent consequences other than a slightly dilated left pupil), I was back for more. 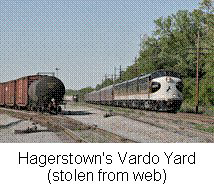 Hagerstown has unwittingly created a convenient nexus for D.C.-based train-hoppers: its commuter bus stop, a Waffle House, and a Sleep Inn are within 100 yards of each other and maybe a half-mile's walk from the Norfolk Southern yard. In past years, I took Greyhound to Hagerstown. However, with America's most despicable carrier having downsized its service, I overcame my usual end-of-workweek fatigue and instead caught the last 991 commuter bus of Friday evening to Hagerstown: $5 each way, less than ¼ of the 'hound's fare. I had to marvel at how convenient the Sleep Inn was, literally across the street from the bus stop. The next morning, after devouring the free breakfast and pocketing an apple, I transitioned from respectable hotel guest to despicable outlaw clad in instantly invisible dark clothes and a coating of Off. The vigil this day in thorny but usefully dense woods took 5 hours. I sat dripping in that hateful East Coast sweat, something that never happened in the glorious, arid West. Periodically, I beat my way through the thorns to seek a better scouting location and dripped some more. One patch of brush did have mulberries that I ate off the branch. I let a couple trains go as I wrestled with whether to go north or south. Eventually, after ruling out a southbound carrying nothing but ballast, I trudged, dripping still more, past a succession of garage sales until I found the Virginia Ave. overpass overlooking the tracks. A strip mall's parking lot beside the tracks seemed a decent place to wait, since that street had a post-nuclear winter absence of motorists and pedestrians. Maybe it is true: nobody has money to drive around or shop anymore. I was in mid-yard between idle strings of cars when a southbound and northbound rolled through, respectively, on the east and west sides. The northbound was heading behind a patch of woods. I raced through thorns and trees and out the other side and grabbed onto a grainer. The cornfields and woods were lush from the rain and humidity that have been my bane during this hideous exile. This was not grand scenery, not the deserts of the West where you can see the curvature of the earth on the horizon, not the Book Cliffs in Utah, one of the world's longest escarpments. But one could go on indefinitely about what it is not. I stayed uncomfortably hunkered down in the cubbyhole, which the hobo-unfriendly industry has downsized to such an extent that I had to manually fold my legs into it. The cubbyhole, cramped though it was, also made for the best place to wait out the sudden, lashing downpour that lasted for several miles. Eventually, even in Pennsylvania, the sun will come out. After two hours to cover about 70 miles, I spotted the freeway signs for Camp Hill and Gettysburg that signaled the impending end of my ride. Harrisburg is so small that it has almost no transition from farmland to the 19th century trestle that crosses the Susquehanna in sight of the splendid state capitol. Almost immediately came the fun part, the 15-mph dismount. 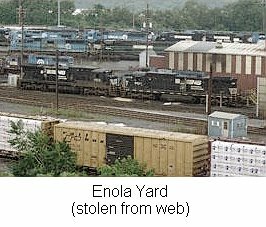 I had no interest in sailing into Enola Yard, one of those railroad testaments to past industrial might that can be measured in square miles and teem with dozens of indoctrinated workers all eager to inform on the enemy. Memories of past rides always dart through my head during these times, including the advice from a fellow rider in 1991 as we bailed from a Southern Pacific freight in Portland. "You can get off faster than you can get on!" advised Clark, who then demonstrated it. For a few exhilarating seconds, as you cling to the train and sprint down the tracks, you can match Usain Bolt stride for stride, since you have 30,000 horsepower yanking you ahead. I churned through the ballast like Wile E. Coyote and let go. The train clattered away, oblivious to the gnat that had just stolen a ride. It's all great fun as long as you don't run into a pole doing your 4-minute mile. No modern-day Vichy Frenchman was around to betray me. I headed down to the Amtrak/Greyhound station, bought a ticket for the awful but cheaper bus, and adjoined to a bar with $2 pints in the heart of Harrisburg's reviving downtown. The Bourbon Street Saloon is a cheap place to slam down pints, rehydrate, and celebrate the end of a hiatus that lasted far too long. The hated East Coast exile continues, though, with no relief in sight.